Wisdom's Kiss is a children's fairy tale akin to Shannon Hale's and Jessica Day George's. There is a princess, magic, a scheming villain, a suspiciously smart cat, romance and a happy ending.What distinguishes this tale from others in the genre is the book's format. Wisdom's Kiss is an assemblage of letters, diaries, a play, memoirs, encyclopedic entries, etc. Generally, I am quite fond of such narrative, as long as all formats are essential to the story and do not create redundancy. Here, however, what starts as an entertaining switching POV fun (every one of them opens an opportunity for a different kind of humor), soon becomes too busy, too indulgent, too repetitive. IMO, this novel would have worked much better told from only one perspective.Interestingly, in the interview in the end of the book, Catherine Gilbert Murdock answers a question about this 8 POVs format. She says the story started with 3 POVs (for three sides of a love triangle) and then she added more and more to accommodate a new scene or to showcase a character's trait. If you ask me, this is not a very inventive way to develop a narrative, lazy even. Many times I felt that by introducing a new perspective to give some info or make a joke, the author forced herself into continuing on with it throughout the book with nothing actually to say. In the end, Wisdom's Kiss is a fun (for the author) writing experiment that has 7 POVs too many. In some ways it reminded me of another fun exercise - Ransom My Heart by Meg Cabot- a romance novel parody supposedly written by the main character of her Princess Diaries series. It is an amusing joke for the first 20 pages, it is tiring the other 300.Maybe the book's intended audience - children - will enjoy it more? In all fairness, Wisdom's Kiss is an original and lively story (if you skip repetitive parts). I love Catherine Gilbert Murdock's writing because it is intelligent, highly unconventional and always makes me laugh. Wisdom's Kiss is even more unconventional than her other books, and I would highly recommend it for brave readers. The storytelling is unusual with each character narrating their part in 2-3 page chapters, alternating between the script of a stage play, letters from one character to another, diary entries and heirloom stories passed on to a younger generation. The characters are distinct and their voices recognizable, but the brevity of the chapters prevents the character development from progressing very far. The storyline is like nothing I have ever come across. As we found with Princess Ben, this fairytale is highly unconventional and readers will need to cope with a little heartbreak before it finds a resolution. Murdoch explained her motive for the unexpected plot twists as wanting to help young readers understand that they probably won't discover their true love by the age of 16. This is a wonderful improvement to the overly sentimental literature that clogs young adult shelves, although I'm not certain that all young readers would find their hearts sufficiently consoled by the end to actually like the story.Mature readers who can brave the unconventional format and storyline will find it rewarding and worthwhile, though it probably wouldn't suit young readers looking for a nice sweet read. I love this author's contemp YA's so was eager to try her fantasy. I am very sorry to say this book drove me crazy. I'm 2/3 of the way through and it's been a constant struggle. The story is told in an epistolary form (one of my favorites) but there are too many POVs. EIGHT! And a lot of it is a redundant telling of the story, which makes a very thin, weak plot unnecessarily long. There was quite a bit of humor and wit in the story, but it didn't make up for the weakness of the story or the characterizations. And that is the bottom line, sadly: I didn't care about any of the characters.I've been skimming and will till I reach the end, just to see how it ends. I wanted to love this book. It had a cute format, told through letters, autobiographies, encyclopedia entries, etc., and each character had a unique voice. However, the format also served to distance me from the characters a little, and while the external plot was fairly sound, the characters themselves didn't seem to go through much transformation at all. I would recommend this book to people who are fans of diary-style fiction and lighthearted reads, but there's not too much substance here.Also? Least satisfying romantic plot ever. The jacket blurb makes this book sound like it will be a cute and happy story with a strong romantic plot. Ignore that. Overexcessive stylistic writing, a lack of plot movement, characters who seem to be more concerned with the number of curlicues they can insert in their writings than in being complex and likable... It's a shame that the straightforward and heartfelt charm of her D.J. Schwenk novels has never translated into her fantasy forays. Tone down on the epistolary cuteness and focus more on giving readers a good and engrossing story! Trudy is a young orphan with a gift for seeing the future. Tips is also an orphan, who struggles with the oppressive hate of his older brothers and the dismal future of running the family mill. They’ve been best friends since infancy, and Trudy hopes Tips is her future. When a man comes to take Tips as his apprentice to become a soldier, Trudy hates to see him go but knows it’s for the best.Six years later, when both are grown and waiting to be reunited, fate and politics intervene. Suddenly, Trudy finds herself as Lady-in-Waiting to Princess Wisdom, or Dizzy for short. Dizzy is traveling with her Grandmother, the Queen Mother Benevolence, to her wed a conniving duchess’s son.When Trudy sees the princess, she senses pain. Dizzy will cause Trudy heartbreak and pain.Too soon, Trudy and Tips meet again, but Tips has been keeping secrets. Trudy’s vision of Wisdom comes true. But can the two abide each other long enough to save a nation?--The title and cover of this book was so intriguing, I was very excited to read Wisdom’s Kiss. It started off gripping! And then it turned confusing…I didn’t realize this book was told from no less than eight point of views! Memoirs, letters, diaries, encyclopedias, and a play. A play? Yeah. A play. It’s completely random, slightly genius, and a bit confusing. I would love to say, “Oh, the author should have just cut out…” but the rest of the story wouldn’t have woven as well. It’s just a bit tiresome to work that hard to figure out what’s going on.The story itself is really good. I have to say though, I was furious with Tips. Furious. I won’t say more than that. But his act alone put a sour taste in my mouth that I never really could get rid of.The author wrote Princess Ben, which I read well a over a year ago. I remembered a few key points from the book, and I remembered that I really liked it.While reading Wisdom’s Kiss, I thought, “Wow, this author really likes the name Benevolence.” Which she shortens to Ben. And then, further in, I thought, “Wow. This author really likes to use doppelgangers in her books.” And then a light flashed so brightly in my dense little head that I was practically blinded! The Queen Mother Benevolence is Princess Ben! While the author asserts this is not a sequel to Princess Ben, and I’d agree, I still thought it was kind of a forehead slapper when I realized it. No, you don’t need to have read Princess Ben to understand Wisdom’s Kiss, but I wish it hadn’t been so long since I read it. I might have picked up on a few things I missed.While I really did enjoy the story, I was completely thrown by having to work so hard to understand what was happening. Plus Tips just ruined it for me. Although not obviously apparent for most of the book, this is actually a reimagined fairy tale. The whole thing does read like a fairy tale, with princesses and betrayal and cats and magic. What makes this book really stand out is the method that Murdock uses to tell the story. Most of the plot unfolds through characters memoirs written ex post facto, diary entries or letters written to others. There are also little snippets of plays interspersed between the other formats. These generally depicted a scene that had been already described but in extra-dramatic Shakespearean style. I thought this way of telling the story showed ingenuity and was surprisingly effective.The characters, however, did not meet with similar satisfaction. So many of them were incredibly dumb, including the poorly-named wisdom. Really the only one I liked at all was Trudy, who had a seriously awkward ending. She's the first character you meet, but her story is rattled off like a note in the end credits. The Queen Mother, who I believe is Ben from Princess Ben, one of Murdock's earlier novels that I have not read, is awkward. If her young character is anything like this crazy grandmother, I'm not sure that I want to read that book. If young Ben is not this way, why would you do this to her? And what happened to her husband?My only previous experience with Murdock was Dairy Queen, which I did not like. For one thing, I have no interest in football. For another, the main character was not the brightest bulb on the Christmas tree, which, since the story was written in first person, meant that the writing was not particularly good. Plus, she was a serious jerk to her best friend when the friend confessed that she was a lesbian. The writing in Wisdom's Kiss was, for the most part better, although Tips' letters drove me crazy.All in all, this is a very odd book, but it was rather amusing and constructed in a unique manner. I enjoyed reading it and my opinion of Murdock has improved slightly, but she's still not going to be a favorite author. Orphaned Trudy and the miller's son Tips have long been friends when Tips is offered an opportunity to become a solider. He becomes an apprentice to Felis el Gato and spends years away from Trudy, communicating only by mail. Trudy, who has a gift of foresight (to a certain extent anyway), stays in their village, hoping for his return. When Princess Wisdom, on her way to her wedding, and her grandmother, Nonna Ben, stop at Trudy's inn, they enlist her to become a lady-in-waiting, as their ladies-in-waiting are suffering from food poisoning. Trudy, although sensing that Wisdom is going to bring her unhappiness, accompanies them to Frogloch, where all sorts of unhappiness ensues. She's reunited with Tips, but things don't go as she'd hoped, the princess realizes she wants adventure more than marriage, and Duchess of Farina (Wisdom's soon-to-be mother-in-law) is enacting her nefarious scheme to expand her control in the land.This book has humor, love triangles, adventure and more. There's a lot for readers to like...and yet, I'm not entirely sure I liked it. In fact, thinking more about it, I think I didn't...because the character I liked most got treated the worst. So, I didn't like the ending. (Spoilers below if you want to know what exactly I didn't like.) And I much prefer Murdock's realistic fiction to her fantasy.SPOILER ALERT*****************I like Trudy; she's the most likable character. Wisdom (a.k.a Dizzy) never won me over. She seemed ditzy, irresponsible, and selfish. So, when Wisdom falls for Tips, whom Trudy has loved her whole life, I was pulling for Trudy...and Tips picked dumb Dizzy. Argh. And the author "resolves" this issue by giving Trudy a husband, but it's presented more as an aside, so we never really get to see Trudy's happiness (assuming she is actually happy with her husband). I just didn't like to see my favorite character get the shaft...and what kind of dummy picks Dizzy anyway? Now this is what I call creative writing! Some people take issue with Murdock's use of multiple P.O.V. 's (eight in all!). However, as detailed in the author Q&A at the back of the book, Murdock did what a writer's supposed to: Tell the story. If the P.O.V. being used isn't serving the story, then change the P.O.V. or do as Murdock did and add new P.O.V.'s. Perhaps eight points of view seems excessive to some, but it works and what results is a richly layered and deeply nuanced tale. And even though this is a tale of fantasy, there is an element of reality to it as well: With the use of varied and sometimes conflicting viewpoints, one can see how real actions can be transformed into folklore and fairy tales. Multiple viewpoints allow for a well-rounded perspective on the action; there's always more than one side to any story and there will always be those who put their own spin or interpretation on events. Lines get blurred, fantastical stories get rationalized into dull yet more "realistic" occurrences, and people start to believe that what really happened couldn't have happened. Mix in entries from a Encyclopedia (a gimmick which appealed greatly to my inner geek) and voila! you've got an instant winner on your hands.Despite all that, the multiple P.O.V. 's could've been just that, a gimmick, a ploy to take the reader's attention off a lame or underdeveloped plot. Thankfully that's not the case here, as Murdock's story is just as inventive as her method of telling it. The characters are all unique and while not all of them are likable, they're believable. I will say this, though: Tips is a fool. While I understand and applaud Murdock's intention to avoid the cliche of a girl finding her true love at age 16, the way Tips and Trudy's story turned out seemed wrong. (view spoiler)[To seemingly lead Trudy on and then, when they meet again, to effectively tell her "Sorry, I did love you, but now I love this other girl" is just plain mean. Then again, Tips is a man and like all men can't see the treasure in front of them, instead becoming dazzled by the new and exciting thing flashing in front of their face, thereby hurting the one who loves him best. (hide spoiler)] However, taken as a whole, the novel is quite satisfying and the ending, while not the one I would've picked for the main characters, manages to tie things up nicely and in an entertaining fashion. One thing's for sure, Murdock had quite the fun time coming up with names of towns, countries, even some battles; as you read and come across these names, they make for an extra giggle or two.Some have said that Wisdom's Kiss is a retelling of certain fairy tales, but I disagree. I see it more of an homage or a re-imagining at the very most, seeing as there's more than one fairy tale involved in the book. We have the sleeping princess as in Snow White or Sleeping Beauty, but, presented in a very unique voice, we also have the appearance of Puss 'n Boots (who, coincidentally enough, sounded very much like Antonio Banderas in my head), as well as some influence from German and Arabian folklore. In entwining these various characters, Murdock has created an entirely new and thoroughly entertaining fairy tale. Original review posted on The Book Smugglers HERE This is the true story of the event known as Wisdom’s Kiss in which: a Kingdom was saved, hearts were broken, a Circus flourished, magical shenanigans were deployed and true love was found.In the Kingdom of Montagne, Princess Wisdom wishes for a life of adventure but finds herself about to settle down and get married; Fortitude, an orphaned kitchen maid, awaits for her childhood sweetheart to return from his travels; Tips, a soldier, misses his love but has a secret he can’t share. Meanwhile, a villain is concocting a plan to steal a Kingdom.Wisdom’s Kiss is written in epistolary format and the story is told via diary entries, memoirs, encyclopedia excerpts, letters, biographies and even a stage play. Tips (and his letters), Wisdom’s (and her diary) and Fortitude (and her biography) are the main characters and their lives and actions are intrinsically connected and are instrumental to the plot regarding the future of the Kingdom.First of all, it needs to be said that my love for epistolary novels knows no bounds. I love this type of narrative and as such I was already predisposed to enjoy this book. And some of the entries were tremendously fun and clever. I had a kick of so many things in this book: fairytale connections, awesome villainy, and small things like the fact that Fortitude’s biography was called “ A Life Unforeseen” which I found so amusing considering that Trudy was a seer. I particularly enjoyed Tip’s letters because they were so earnest and had an element of unreliability (because of the secret he was keeping and how he kept erasing words and replacing them, the significance of this is huge, as we come to learn) but above all, I loved the Memoirs of the Master Swordsman Felis El Gato (written in his own hand, all Truths verified – all Boasts Real) because they were downright hilarious.Having said that, this narrative form is very difficult to pull off, specially in terms of character development. Not to mention that it requires a lot of rapport and careful attention from readers as, more often than not, character development works subtly in between the lines, and things that are left unsaid are as important as the things that are said (or written). Although most of the characters were fun, I felt that the majority of them were only surface-deep. Plus, there was definitely an element of insta-love which I came to despise of late. The story definitely works in terms of plot though, especially when all threads come perfectly together in the end.Ultimately Wisdom’s Kiss is a short, sweet plot-driven tale of adventure and romance and I had great fun reading it. More than that, this introduced me to a new author and I am quite curious about other books by Catherine Gilbert Murdock and will be reading Dairy Queen – which I hear, is fab, soon. Originally posted at:http://longandshortreviews.blogspot.c...The cover of this book has the words “A Thrilling and Romantic Adventure Incorporating Magic, Villainy and a Cat”. These words say it all. Princess Wisdom (Dizzy) becomes engaged to the man who has arrived to court her sister, Queen of Montagne. She travels with her grandmother (Ben - Queen Mother of Montagne) to her betrothed’s home. Crisis after crisis delays their arrival, eventually stranding them in an inn in Bacio with their ladies-in-waiting suffering from food poisoning.Trudy, chambermaid at the Bacio inn, has written to her childhood sweetheart Tips for years. She has the ability to see the future or, to be more exact, which is the right path to take for a good future. Unaware of this, the Queen Mother invites her to join them as a lady-in-waiting for their visit to the duchy of Froglock where Dizzy’s intended awaits them at Phraugheloch, the ducal residence.Although her prescience warns Dizzy is not good for her own future, Trudy is overcome by the knowledge Tips will be in Froglock. Lady Fortitude, the title Ben gives Trudy, arrives in Froglock and chaos erupts. Dizzy’s future mother-in-law intends to get rid of her after the wedding, the Emperor is also in Froglock with his own hidden agenda. Tips and his master have accompanied him. The fairy story takes a dark twist as they all try to achieve their own aims.I thoroughly enjoyed this book, a modern fairy tale complete with hero, heroine, villain and various helpful minor characters. Despite the eight points of view it flowed well, carrying the story seamlessly throughout the book.Both Trudy and Dizzy’s inner thoughts added spice to the story, but still kept it sweet and light. At first I wondered where the author intended to take the storyline but after a few chapters I didn’t care. I was too entranced by what would happen next. If Star Wars is a futuristic Cinderella, then Wisdom’s Kiss is a realistic Cinderella. I say this because the actions and reactions of the characters reflected the way modern misses would react in similar situations.To get the full flavour of this story the book must be read from cover to cover. Delightful, engaging, captivating. These three words describe my feelings as I read this book. Suitable and entertaining for any reader, young and old. Catherine Gilbert Murdock said that she "enjoyed Wisdom's Kiss more than anything [she'd] ever created." Of the five books of hers I have read, I have to admit it was my least favorite. I adored her modern-day teen Dairy Queen series. It's not that I don't like fantasy--I really do very much. It's that WisK (the author's shorthand title) was told from eight (EIGHT!) viewpoints, which, while allowing for varied perspectives and dramatic tension, made it a bit hard for me to keep track of what was what, at least until I got thoroughly enmeshed in the story. I see that it helped the author control the pacing of the story and did a good job revealing the internal and external conflicts for the characters, but it made me less able to identify with the main character; I wasn't entirely sure which one was the main character (my favorite person actually became the Dowager Queen Ben.) I'm sure Catherine Murdock had a lot of fun creating and keeping consistent the various voices: 1. Fortitude of Bacio, known as Trudy, in a biography by her daughter2. Excerpts from a screenplay, "Queen of All the Heavens"3. Reflections from Wilhemina, the ambitious Duchess of Farina4. The Encyclopedia of Lax, giving background information about the various kingdoms and important people in the empire of Lax5. Letters from Tips to his childhood friend Trudy6. Letters from the Queen Mother Ben to her daughter Temperance (the heroine of the previous book Princess Ben years later; read this book first for a fuller background to this present story)7. Entries from the private diary of Wisdom of Montagne (known as Dizzy)8. The Memoirs of Felis El Gato, the Booted Maestro.I actually liked the back material the very best. Murdock's glossary of unusual words in the books was funny and clever. Be sure to read it. And I loved the inside information about how Murdock puts together her stories, based on the structure and format of three-act play: the first quarter introduces the characters, the middle two quarters escalates conflict culminating in a "low point" (I really noticed and felt this in this story), and the last quarter resolves everything and the hero emerges emotionally and/or physically victorious. I loved the internal and external conflicts of the character and the pacing of the story. I actually think I'd enjoy reading this book a second time noticing all the craft of writing. Luan, you would love this back material!! Had this book ended differently, it would have been a 4, maybe even 5 star book in terms of my personal enjoyment, but, it ended the way it did which added a level of frustration that marred my enjoyment.This book is basically a re-telling of Puss in Boots with a smattering of other fairy tale references thrown in, so I get why Tips ended up with the princess; that's what happens in the story. What was the point then, of having a love triangle which is not part of the original story? My frustration is thus: 1) I liked Tips, 2) I loved Trudy, 3) I did not like Dizzy (Princess Wisdom), 4) love at first sight stuff is LAME, made even LAMER if there are two people who have known and loved each other their whole lives, but the person the guy has known forever gets DUMPED for the "true love" new girl. LAME! I may have changed my mind had Dizzy been more likable, the feelings of Trudy for Tips been less strong, and if Tips had never shown any indication of loving Trudy as well before Dizzy came along. Also if we had gotten to see Tips and Dizzy fall in love, but we don't get to see that at all. It's an instant, unbelievable thing.Murdock does a wonderful job of making you feel for Trudy, so you feel her heartbreak. I felt nothing for Dizzy and Tips, just really sad for Trudy. I don't think that was Murdock's intent because overall the book is light and funny, but my heart just broke for Trudy at the end and that spoiled the *fun* that the book had been up to that point.It took a few chapters to get used to how the story was told (letters, diary entries, memoirs, encyclopedia entries, and a play), but once I did, I found it kind of fun to see how each chapter was different and to put the bits and pieces together into a coherent story. And I did like it. Most of the book is really cute and fun. It's just that dang ending. 1.5 starsThis book had a lot of great potential, but it ended up falling flat in a lot of ways. It took me a while to get into it because of all the different characters and perspectives, but eventually the action picked up a bit and I was intrigued. Then something specific happened with two of the characters (which I can’t reveal without being spoiler-y) and I seriously began to resent this book. I kept hoping it might get better, but it really didn’t.My first major complaint is all the different perspectives. There were just too many characters to keep track of, and the switch to a different format (e.g. letter, memoir, encyclopedia) often cramped the narration style. The two perspectives I really enjoyed were Nonna Ben’s letters and Trudy’s memoir, and it seemed like whenever I was getting really interested in what they had to say I was whisked into another perspective.I have a hard time finding much of anything positive to say about the book. I didn’t find the characters very interesting: again, I liked Trudy and Nonna Ben, but I pretty much despised Dizzy and Tips, the other main characters, because they were so selfish. There was also the presence of insta-love to the extreme, which was incredibly ridiculous.The thing is, I think the story had a lot of promise. A more humorous fairy tale type of story sounds utterly appealing, and even the different types of perspectives can be awesome if done well. Instead we’re left reading a choppy story with underdeveloped (and often unlikable) characters. I have to admit that I only finished this book because I got it for review. If it were from the library I probably would have quit half way through, or maybe even sooner. 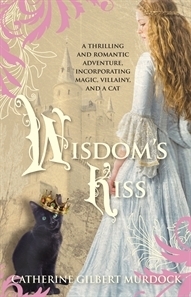 Wissdoms kiss By:catherine Gilbert MurdockDo you like fairytales? If you do like fairytales like I do this is the book for you. Wisdom kiss is a story that is romantic and like a fairytale. You might also like it if you really like fairytales.The setting in my story is old kingdom the old of Montagne. This is important in my story because it is where it all takes place. The main characters in my story are Princess Wisdom, known as Dizzy, a soldier Fortitude, a cat and an orphaned maid. The conflict in my story was person vs person. The them of my story is learning to get along. The story Wisdoms kiss is about a princes named Dizzy a soldier and a maid who go on an adventure but the problem is they can’t stand each other.A major event in my story was when they all came together to try to figure out a plan this is a major event because whit out it we would of never known how the adventure would have gone or end so it would have cut much of the story.What I though was so great about the book was that it mixed a variety of different writing styles in to one book which was great. That is what made this book a one of a kind book I have never seen anything like it before.I would rate this book a 4-5 stares because it was a good book but it was not the best book ever made. I would recommend this book to people who like fairytales and different writing styles. These were some reasons on why you should read the story wisdoms kiss it was a good story but a bit hard to understand. I liked this book enough to finish it and there were a number of things I thought Gilbert-Murdock did well. The plot was excellent as was the world building and the characterizations. The novel was, in essence, a screwball comedy of people falling in love with each others' boyfriends minus the jokes.What I didn't like was the style. The author told the story of (Wisdom? Trudy? Queen Ben? The Cat?) with 8 different POVs, one of which was written in screenplay form. (Note to the author: plays are to be preformed, not read. There's a reason everyone detests taking classes in Shakespeare.) Another point of view consisted of encyclopedia entries--those were beyond dull.Who was the main character in this book? Hard to say. Also, this is apparently the third in a series. I haven't read the first two and was somewhat lost in the beginning. The world created here was very intriguing but the author didn't explain things very well-- she obviously assumed that readers already knew this world. Told from 1-3 POVs, this story would have been fantastic but, with it's fragmented format, I can't rate it any higher than average. This was was entertaining to read. It is told from various viewpoints; diaries, letters, histories, some true, some perhaps embellished. I lilked the style of it with those various voices. Unfortunately, it didn't quite all add up to a great story. It seems that the sum of the parts are far less than the whole in this case. It feels as if without the literary gymnastics, which are fun so I'm not complaining, this wouldn't be much of a story. Maybe because of the various focuses, it didn't feel that there was an actual center, no one character about whom you cared. I felt as if I only knew a little about each and some of them, Wisdom in particular, I didn't much care for. Nor the hero who, although handsome and heroic, also broke a girl's heart and then blamed the girl to whom he had repeatedly lied for her own heartbreak. Did. Not. Like. That. How can I hope he will live happily ever after or Wisdom, when both of them appear so self-centered and uncaring about anyone but themselves?I think I like her modern day books much better. To be fair it warns you that it is written in many different voices. And most times I don't mind books written in differ POVs however, this became tedious.There are many different players and many different parts and the ending isn't at all as I hoped it would be. The main characters Trudy, Tips (Tomas) and Wisdom aka Dizzy. Not to mention Nonna Ben, Teddy, Felis and the list goes on.The book is largely clips from Trudy and Tips life from childhood to approximately 18 would be my guess. There is a large bit of deception on one of the main characters parts, a lot of love on another's, a lot of intentional misleading by the author I think a bit of trickery, magic and such.To be honest I didn't like the ending although the author tried to make it all tie up nicely *blah, blah, blah*In all I just wasn't happy with the layout, voices or outcome. This may appeal to others just not me. Upon reading this book, I felt the same way I felt finishing Princess Ben--lukewarm. There is just something missing from Murdock's fantasies--I loved her realistic series (Dairy Queen, etc.)though. This new title is a mix of diary entries, encyclopedia articles, memoirs, and third person storytelling, in an attempt to tell the story of three young people whose destinies intersect. Trudy is a beautiful servant in a village inn; Tips is her adored friend, with whom she is in love, but he's off with the circus; Wisdom is the granddaughter of Ben and on her way to marry a duke (who has dubious motives). How the three find their paths is the meat of the story, with much heartbreak and confusion along the way. It was difficult to get to know any of the characters well with such disjointed storytelling, and honestly I couldn't care very much. The plot was thin and uninteresting. Skip this one unless you love this crazy quilt approach to fiction. I wanted to love this book. Catherine Gilbert Murdock's Dairy Queen series is fantastic, with one of my favorite heroines. She has such an authentic, realistic voice. Truly, I had great expectations when this book caught my eye last time I as at the library.And not that the writing is bad. I just couldn't get into it. Most likely it was the variety of formats that threw me off - I never felt as if I got invested in any one character because things constantly shifted as far as view point and method of narration. By a third of the way through, I began skimming. I was able to get the gist of what I felt compelled to know (who loves whom) and didn't have any urge to finish the book.Great idea, not so great execution. A DNF for me. This is one of the best examples of "gutsy" writing I have ever seen. It is told from 8 different points of view--and it completely works...you couldn't imagine it told any other way. The vocabulary is very sophisticated, the literary references are abundant and sometimes a little obscure, but I'd be surprised if either of these elements makes a single reader skip a beat. (Also, the author included a glossary which is almost as entertaining as the story. )I found the ending to be oh, so slightly unsatisfying...but the brilliance in the writing was enough to compensate. A great example of how breaking the rules can work to your advantage if you know how to do it right. Catherine Gilbert Murdock - I grew up in small-town Connecticut, on a tiny farm with honeybees, two adventurous goats, and a mess of Christmas trees. My sister claims we didn’t have a television, but we did, sometimes – only it was ancient, received exactly two channels, and had to be turned off after 45 minutes to cool down or else the screen would go all fuzzy. Watching (or rather, “watching”) Alfred Hitchcock’s The Birds was quite the experience, because it’s hard to tell a flock of vicious crows from a field of very active static; this might be why I still can’t stand horror movies, to this day.My sister Liz, who is now a Very Famous Writer with a large stack of books, was my primary companion, even though she was extremely cautious – she wouldn’t even try to jump off the garage roof, which involved crouching right at the edge for ten minutes working up your nerve, and then checking each time you landed to see if you’d broken anything – and she learned early on that losing at games was easier in the long run than putting up with me losing. Now, of course, she travels all over the world collecting stories and diseases, while I stay at home scowling over paint chips, and losing on purpose to my kids. So the cycle continues. (Read an New York Times article by Catherine and Liz. )People sometimes ask if I played football in high school: no. I ran cross country and track, badly, but I have absolutely no skill whatsoever with ball or team sports. Plus my high school didn’t even have a football team. Instead, I was part of the art clique – taking extra art classes, spending my study halls and lunch periods working on my latest still life. (Please tell me this was not a unique experience.) I didn’t do much writing – my sister was the anointed writer – but I read my little eyeballs out. I was the queen of our library’s YA section.In college I studied architectural history. The formal name was “Growth and Structure of Cities Program,” but for me, it was all about buildings. I’ve always been fascinated with the built environment – how spaces fit together, how streets work, how they read. And curiously (Warning: Life Lesson approaching), it’s paid off in the oddest ways. For example, several of us in our neighborhood recently got quite upset about a enormous building going in across the street, and while everyone agreed that they didn’t like the way it looked, I was the one who stood up at public meetings and used words like entablature and cornice line and fenestration – all this architectural jargon I’d learned back at Bryn Mawr – and sounded like I knew what I was talking about. And because of that, the building ended up getting redesigned, and – in my humble opinion – now will look much more attractive and appropriate, which is nice because I’ll be looking at it for the rest of my life. So don’t be afraid to study what you love, because you do not know now, and you may not know for twenty years, how amazingly it will pay off. But it will. Dairy Queen was my first stab at creative writing since high school, not counting several years as a struggling screenwriter (which followed several years as a struggling scholar). I unabashedly recommend screenwriting for mastering the art of storytelling; just don’t pin any hopes on seeing your work on the big screen. But you’ll learn so much in the process that this won’t matter. I also recommend, you know, living. I've been passionate about food pretty much my whole life – first eating it, now preparing and then eating it. And so it plays a pretty big role in my writing, and adds so much flavor . . . not literally, of course, but the more you can add that's true, whether it's emotion or geography or gardening (that’s me in the picture above), then the stronger that story is.